MIR: Although only a short time has passed, what has been the relationship with the artistic scene in Barcelona ? FB: As I said, we want to comply with this position as an art center. We are not a museum, we have no collection, but we are not exclusively an exhibition space either. In this sense, the energy we dedicate to our activities is very important, Antonio Ortega, who is an artist, takes care of this aspect of our programming. We try insofar as is possible to make our activities a departure point for discussions and debates on contemporary art. We have several lines of work, for example we are very interested in audio, works with sound, whether by visual artists or contemporary musicians which, seen from the visual arts viewpoint, are of great importance. We also have another space which is called Consultation, which is a media project under curatorial direction that presents documentation within strategic subject matter. Consultation follows the logic of the center itself, in the sense of being seasonal. At the present time, for example, we are showing a project on the influence of Deleuze on contemporary music. MIR: This new phase of Santa Mónica also implied a series of changes at architectural level. Can you tell me about that? FB: Although it is true that we have been an art center since the eighties, and won many awards at that time for its renovating design, at the present time a reform is in order since it was necessary to have the Center fill current demands. It has been remodeled with a post-modern way, it basically had a paintings hall and a sculpture hall and a clear hierarchy was denoted by these spaces - it was better to exhibit below and, as you went upwards the space became more discreet. Now we have halls all working in the same manner and of a very good size. MIR: Returning to the programming, could you tell us about any projects in particular ? FB: Up to now we have been involved in 17 projects : Christiane Erharter; Leandro Erlich; Mabel Palací­n; Albert Tarés; Gitte Villesen; Christian Jankowski; Ester Partegas; Vanessa Jane Phaff; Francisco Queirós; Yamandú Canosa; Lí­via Flores; Tere Recarens; Costa Vece; Pep Duran; Maria Eichhorn; Florian Gotkke; Joí£o Tabarra. María Inés Rodríguez is an independent curator currently living and working in Paris, France. 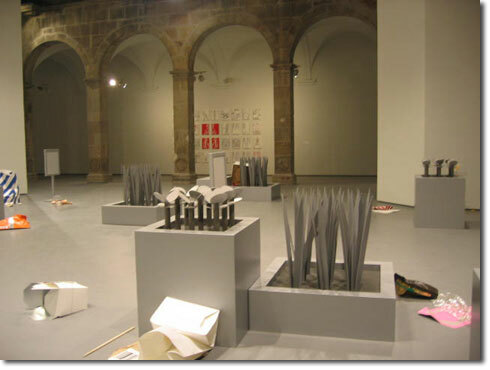 Her latest projects include: Instant city, prepared for the Instituto de México in París, 2003. Seminar De lo mismo a lo de siempre, Universidad Internacional de Sevilla, La cartuja. 2003. De la représentation à l'action, ExTeresa arte actual (México), Planetario Distrital (Bogotá), Le Plateau /Mains D'Oeuvres (París), 2002; Yes, en cualquier lugar puede suceder, 8 signos - 8 días, M&M projects, San Juan, Puerto Rico, 2002; Cutting edge Caribe, en colaboración con Antonio Zaya y Victor Zamudio Taylor, Arco 02, Madrid, 2002.